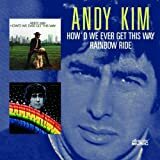 Not the Archies, but the Archies team (Jeff Barry and Andy Kim) at the peak of their musical creativity, with a two-fer reish of dreamboat vocalist/co-writer Kim’s first two albums for their indie Steed Records. After nearly a decade as producer and songwriter for hire for some of the most savvy guys in the business, Jeff Barry found himself with the muscle to bring projects to completion on his own. With these two albums, you’ve got the sound of pop’s finest craftsmen delighting in the formal structures of late sixties pop and forging two dozen lovely little moments. “HWEGTW” is more traditional Brill Building romanticism, with Barry’s trademark eclectic arrangements brimming with handclaps, steel drum and hushed, layered vocals. On “Rainbow Ride,” the pair are mildly psychedelicized, offering frenetic, organ-fueled rockers (“Please Be true”). Love You-era Stonesy rambles (“Nobody’s Ever Going Anywhere”) and with the gorgeous “Foundation of My Soul,” a reminder that, no matter what the hippie critics said, in the magical world of Kim and Barry, love, and pop, are not at all disposable.